BUSY WEEK !! Monday was Ocean Waves Quilt Guild meeting, so that meant an afternoon of loading containers in the SUV, and a 7 am departure to unload and set up for sales before the meeting began, then pack up, store some boxes and bring the empty containers home. (We sold 85% of the fabric we took to the meeting!) I am grateful to be able to store at the church where we meet, and only have to bring home empty containers and new donations. As the week has unfolded, we have had rain coming down in bucket loads. We got most of our unloading and reloading done between rain showers. Our area on the mid-Atlantic coast has been beaten with a Nor’easter storm. Amazing amounts of rain in some areas, with flash floods. Fortunately, I am not on a waterway, or a known flood zone. I have a friend whose parked car flooded in a shopping center lot, where she had parked to carpool for the day. While that particular storm raged for a short time, I was miles away stitching at Embroidery Club. A couple of the husbands called their wives at the club to report on the rains. Yet where we were, 30 miles away, the skies were just grey and gloomy. Early in the week the discussion about Hurricane Florence in the news made us wonder if it was going to come this far North. This morning, the maps look like North Carolina is going to take the worst of the weather. We will be lucky in that case. We are already so saturated after nearly 2 weeks of rain! I can not imagine having to pick and choose what to pack up and take with me in the event of evacuation. We are fortunate! On Tuesday afternoon, while the rain came down, we were busy stitching. I took 2 projects with me to work on at the Embroidery Club. I purchased a design from Embroidery Library and one from Oh My Crafty Supplies. I stitched both designs out on cream colored craft felt. 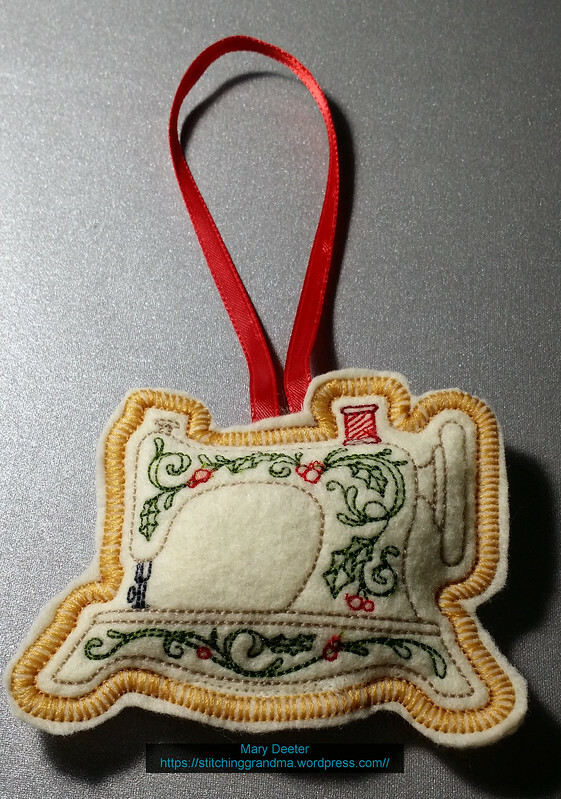 Embroidery Library calls this design a “stuffie”, done “in the hoop”. I chose to use my applique scissors and cut out after the stitch-out. I will try again cutting the shape first, using the dieline template and see which look I like better. It was suggested to me not to use a Water Soluble Topper (WSS) on top of the felt, as it would be too hard to remove, pull stitches or cause problem with the felt. I used a tweezers to remove most of it, and lightly misted the remaining, blotting with a paper towel. I had to use tweezers to stuff the filling in. The stitch out left an opening on the bottom for filling and I used my regular sewing machine and matching thread to stitch it closed . 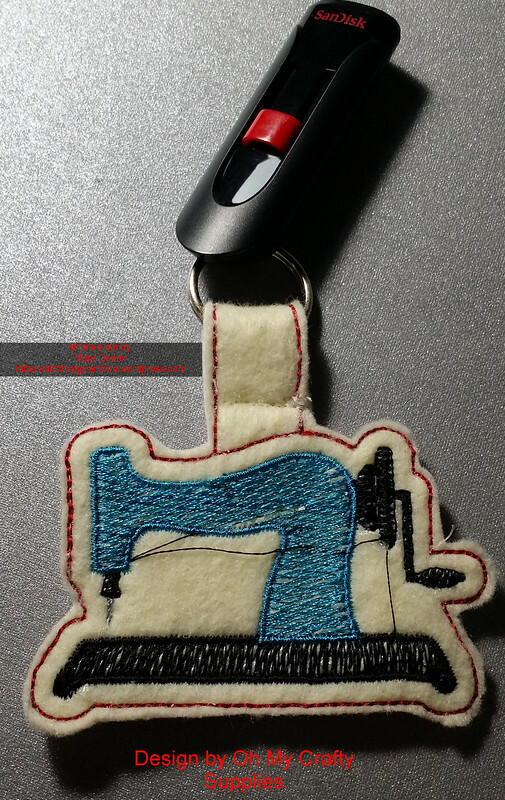 The key fob below is the perfect thing to hold onto my flash drive full of embroidery designs! This stitchout did not give you “placement lines” or “dielines” for placements, so I ran the first color “twice”. First run to create a dieline on my stabilizer, then the second run tacked down the felt with those read stitches on the stabilizer. Right before the final outline stitch, I placed a piece of felt on the back of the hoop so I could have a nice finished backing. Rather than use a snap, I used my sewing machine to close the loop around the keyring. Thoughts – I felt the “fill” on the 2nd one (blue machine) was too thin. I should have gone back in and run the fill a 2nd time. I posted this picture on the Facebook group for Oh My Crafty Supplies and someone said the “SKETCH” design was why the stitching was so light. Hindsight! I am going to try this stitchout on a different fabric and see if I like it better. I haven’t removed the WSS on this one yet, so you still see “shiny bits”. This one I also “trimmed” after the stitchout. It is small, only 4628 stitches, so I think I will try again. LEARNING CURVE…. I’ve been working on my batik placemats. There are 18 of them and more in the works! I took about 6 and used a different backing fabric. 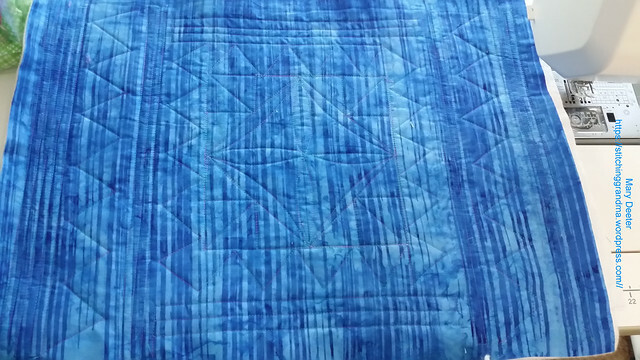 I decided to not do free motion quilting on this group, instead, switched out to my walking foot. I have 4 done and 2 to go. I do a much better job with the walking foot I think! here is a peak at the back! I love the way this worked out. I did measure out those triangles and mark the front with a chalk where the points of the triangles were to land. I decided to do all the ones with this backing in the same manner, so they look like a set! (I like them better than the ones I did the free motion quilting on…..) Somebody (more than 1) will get placemats for Christmas, I just have know idea who that will be quite yet! We use placemats everyday, throw them in the washer etc, but there are too many here to keep. I just love making them. It’s a busy week with meetings, and I am off to the 3rd one of the week in a few minutes. Hoping for time to have a little fun later today! Stay safe, stay dry! note – Embroidery is done on my Brother PE500, which has a 4×4 capability. 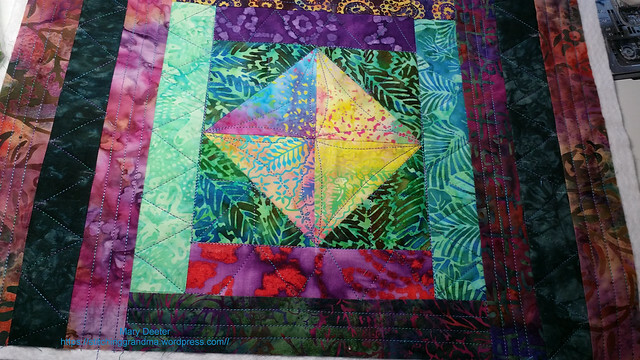 Quilting was done on my Janome 8900. Wow; I am reminded as I logged in to write this blog post that this is the 400th post I have written to share. I started out back in November of 2012 just writing about my projects, and am happy to now have 511 people who follow through WordPress, Blogger and Facebook. Some folks have been with me since the very beginning, and I am honored they have hung in for this long. Recently, I had a great time working with 2 ladies in my “Queen Bees” quilting bee. They are both owners of new embroidery machines, and we spent a bit of time talking about how to “organize” all those fantastic designs they have been purchasing. I shared my methods, using the computer and a “notebook”. Whenever I download a design, I make sure I give the stitch file, and the thread change pdf/doc similar names, incorporating the names the designer has used along with a name that makes some kind of sense, months down the road. I encouraged them to also print out the pdf/doc file, and put them in folders or behind dividers that mirror the “file folder” they used on the computer. The goal overall is to make it easy to find the file you are looking for. I have several thousand designs “stored” on my computer, and I use file categories like Animals, Holidays, Flowers etc. Inside those file categories are sub-folders. So for instance; if I am looking for a Christmas design of “Jingle bells”. I am going to open the HOLIDAY file, and look for the sub-folder called Christmas. Inside the Christmas folder will be my JingleBells.pdf (the thread change document) and the JingleBells.pes file (the stitch file). In the 3 ring binder I keep the printed stitch file pdf, I will have similar tabs or dividers, so I can flip through and make some design choices. (I am on my 4th big 3 ring binder!) Recently I printed out the file directory, and went through my binders, rearranging slightly, and putting names on the tabs that really reflected what was in the computer. Big improvement! About 2 years ago, I wrote a blog post Machine Embroidery Resources, and did a refresher recently with a bunch of new links Updated Machine Embroidery Resources . In both of those posts, I talk about all the free designs available from various sources. I also mention stabilizers, thread etc. I have also written about “moving files” Moving files between the computer and the machine . If you are new to machine embroidery, you may find all 3 of those blog posts of interest. As I mentioned in my last post, I had a Material Girls Bee on Wednesday. It is always fun to catch up and just sew for a while and visit and share projects. Of course, I forgot to bring my show & tell. I was the hostess, so I was fussing about getting the fresh fruit in the car, and happy to know that I didn’t forget any vital sewing items. I love walking around and seeing what others are working on. My table mate Barbara was working on a Quilts of Valor project. We got to ooh and ahh over Cindy’s wonderful “under the sea” applique project she is doing. 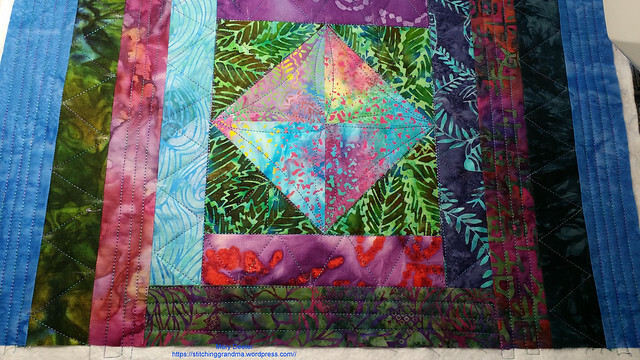 There was another applique project going on by Kathi, and it was her “quilts around the bay” beauty! Jean was working on stitch & flip rectangles for her husbands patriotic quilt. She had a few hundred of them to sew. Judy was basting a beautiful quilt that was all applique done with asian prints. It just shimmered with those lovely metallic shots of gold. Francie finished a mug rug and was starting on a baby quilt. Gayle was cutting for a new quilt, and I am certain I looked at what Cheryl was doing, but now have forgotten completely! We have been privileged this year to use the fellowship hall at an area church and have great space and great light. The ladies arrive and help set up, bringing irons, extension cords, pressing mats/boards; pvc pipes cut “just right” to raise the tables for ironing and cutting etc. So, my job as host is really just bring a few snacks and cart home the leftovers. Clean up is just as easy as set up. Wednesdays are fun too, as the hubby has his train club and I can sew as “long” as I can stay up! I’ve been working on sorting scraps into color waves, and have been through about 5 boxes so far. 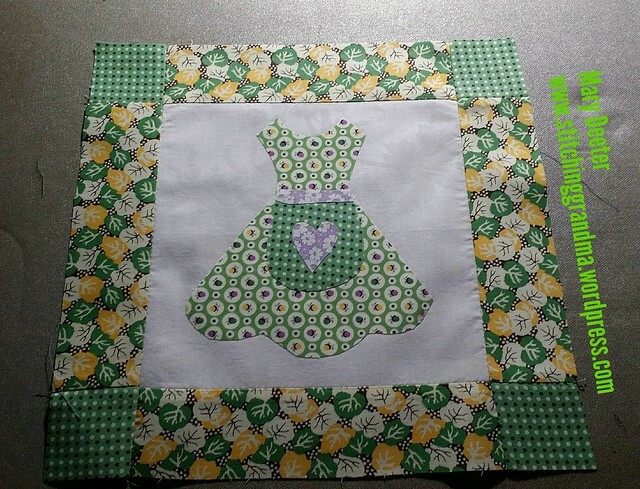 In between the scraps, I managed to do my next block in the Grandma’s Kitchen project by Pat Sloan. 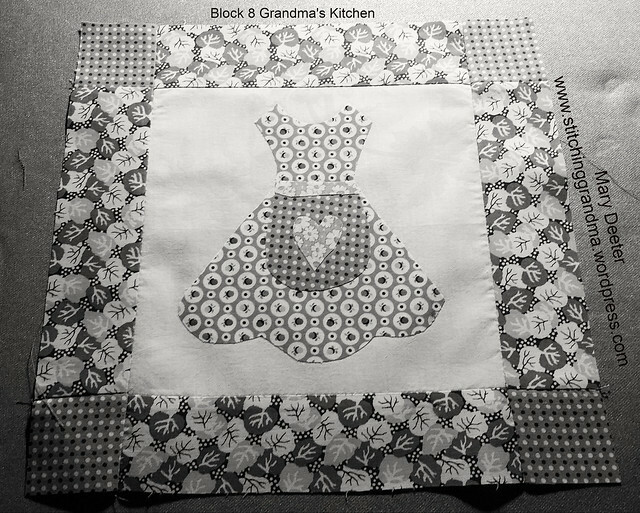 Block #8 of 25 is called Grandma’s Apron. I was able to get the stitching done on my little Brother machine, but will have to wait for the big Janome to come back from repairs to do the blanket stitching. My Grandma Bessie always had an apron on. She was a bit rounder in the waistline than this dress would imply! I remember they were always floral dresses or floral aprons. I am enjoying finding various 1930’s reproduction fabrics that go nicely together and can carry over from one block to the next. If you have been following, you know that I used yellow and green in block # 1. As I have done since the beginning of the project, I converted the photo to black & white to make sure I captured the “light/medium/dark” the pattern was suggesting. I upload my photos to FLICKR from my cell phone, and the B&W option easily available during the upload process. It does help me see if I am getting “close” on the contrasting colors. I will be linking this post up on her page too! Other fun stuff — Hubby and I went and previewed an estate auction on Monday evening. An former co-worker, Ed, let me know about the auction, as it was full of model railroad stuff. He thought my hubby might have an interest and other friends who might also. One man’s treasure might be something we would treasure was the thought process I think. Turns out, my hubby had known the owner of the home and was familiar with the things he collected. What he didn’t know was that the gentleman’s wife was quite the crafter, and had an entire crafting room that was ONE lot . We had previewed the listing on-line, and there were things that caught my hubby’s eye, and we took a ride and spent a few hours browsing about checking lot numbers against the listing, and making sure we understood what the lot looked like and were able to make some value determination. Now, in case you missed it, I said it was an estate auction. I am keeping my eye open for a vintage dining room table for 12! So, I studied the listing carefully. SIGH……It made me very sad to see that no one in this gentleman’s family wanted/had room for/ or an interest in his fantastic model railroad. The train layout was the 3rd stall of a 3 car garage. It was amazing, and done with expertise using the finest quality items. Someone (my daughter….) recently told me to read an article that pretty much summed up the attitude “Your kids don’t want your old junk”. Type that phrase into Google and you will come across article after article about Millennials not wanting Great Grandma’s antique breakfront or Seth Thomas mantle clock or those fabulous cut crystal dishes you worked so hard to collect. As we walked through this home, that had been well loved, and admired the collectibles, the model railroad train layout room, we came across the “craft room”. That room was 6×16, filled with shelving, a treadle sewing machine cabinet (no machine), a 1960’s heavy Kenmore sewing machine; and a work table filled with every kind of crafting implement known to be used up to the beginning of the 21st century. The shelves were filled with carefully labeled boxes indicating the contents, with holiday decor for every season. My friend, Ed, who told us about the auction ended up bidding on and winning the lot. I spent this afternoon helping Ed, his wife, and four of his favorite co-workers (young strong fellas) pack up and load up this craft room. Ed’s wife really wanted that craft room, and she has a big job ahead, sorting out the stuff we hurriedly packed. I never in my life have seen so many individual bottles of craft acrylic paint, and every other type of craft paint known to exist. There must have been 60 or more aerosol cans of spray paints along with every kind of adhesive known to exist. I was amazed! My hubby and I had been tempted to bid on the room because we knew there had to be some hidden treasures. I think I found the one box that will pay them back for the investment they made on the room. It was a box of cut crystal dishes, with an inventory price sheet inside. It was tucked away under a desk with junk on top. The heirs of the estate at this particular auction, could have made a lot more money if that craft room had been “sorted” into multiple lots. Hindsight I am certain. It was interesting to see the number of people coming and going with their prized “lot” they won during the on-line auction. Seeing the happy faces of the winning bidders pick up their items, it affirms what I have told my kids….”don’t worry about our old junk – call the auction house and they will sell everything from the china and silverware to the collectibles and the old toys to the junk in the craft room(s).” They won’t get rich, but someone else will do the hard stuff, like sorting things out. And, it is a lot easier than trying to deal with it on their own. Seems the whole generation is “on the move” and would rather keep it simple, keep it light, etc. I get it, sorta. Hey, I moved 7 times between 1974 and 1986. My one daughter has moved 4 times all locally in this millenium, while the other has moved around the country and world at least 10 times in the last 14-15 years. As we age, it is a good reminder that it is time to start using up what we have, and paring down what we no longer need, so the heirs don’t have to do too much when the time comes (down the road). I’m glad I didn’t bid on the craft room, was happy to help my friend Ed & his wife get it packed up, and happy to know I didn’t bring any more stuff home with me. I was VERY tempted, and if there had been more sewing stuff and less painting stuff, I might have succumbed to temptation. After spending the last 2 years sorting through other peoples sewing room donations, I do know that I must think about what I am keeping, what I should be getting out of my house! And, to stop acquiring things at a rate faster than I can use them……like all those embroidery files I am never going to stitch out! My dear Aunt Jean said there was a time in life when you learn to “Admire rather than Acquire” and I think I am at that point. So, what’s your plan for your beloved treasures, that “junk” your kids don’t want? In closing this 400th blog post, I want to tell you some of the things I learned by writing this blog. I learned that the connections I make with the readers is through their great comments. The comments are conversation, and often times I “chat” back and forth with the reader. I’ve made some “virtual friends” I think with this blog, especially amongst those who have been following from the beginning. I’ve exchanged email discussions and conversation with several readers, sharing information, and learning from them too. I love that readers are sharing my posts. New readers continue to find their way here, and I welcome each of you! When new readers are also bloggers, I try to find their blog right away and follow it too. So, thank you for finding my page, and for taking the time to read along as I share my quilting and sewing projects, stories about domestic life, and sometimes travel, pets and other fun things that life throws my way! 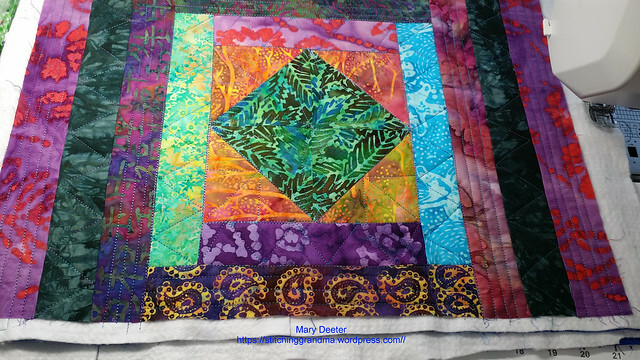 I was chatting with 2 ladies from my quilt guild yesterday about machine embroidery and all the stuff that goes along with having the machine and getting an outcome that you are happy with. I went to a seminar in June with Floriani and learned a lot, and I have been gaining knowledge and skill by following along with the questions comments and answers in a Facebook embroidery group. I thought I would share some of my favorite sources. Designs – I mostly use free designs, however, I have purchased a “few”. I download to my computer into an “embroidery” folder. That folder is split into multiple sub-folders. (Think of it as a file cabinet with drawers). I also print out the color sheet for every design I download, and put those in a 3 ring binder with similar divisions/groupings. So, Autumn harvest designs are in a folder called Autumn harvest; and the printed sheet is behind a tab named the same. Autumn rolls around and I want to make something seasonal, I just flip my notebook open to the Autumn harvest tab, and page through the designs. I tried to stick to just storing on the computer and using a design reader, but that doesn’t work in my brain. Free designs – note – many sites have some freebies on their tabs, but they tend to constantly be the same. These I am listing have different all the time. Of course, they also have designs for sale and they are all very nice quality when stitching out. Most require you to subscribe/join etc. http://www.hatchedinafrica.com/ (Check on Friday for the freebie. Very DIFFERENT designs because the digitizers/shop is in South Africa.) Note – if you are interested in 18″ dolls, they have a site associated that is all dolls. I love the motto of “letting girls be girls” ! Button at the bottom right corner of their website. Cute designs for sale – note; there are LOTS of people selling designs on line. I don’t buy very many, but I love these websites. Digitizing – If you don’t want to buy software, then you send your design off to someone to “digitize” for you . Whenever anybody on the group I belong to on Facebook asks for a recommendation, the first name that ALWAYS comes up is Brad at http://www.ssdigitizing.com/ I’m sure other people do quality work, and you can buy your own software. I haven’t used his services, but will if I need them in the future. The recommendations I read about him are great. Note: Floriani has a line called “Quilter’s Select” that they developed with Alex Anderson (The Quilt Show). She LOVES the Floriani products. I have not been disappointed with ANY of the Floriani products, thread or sabilizer. I have purchased some supplies from Amazon, when I first got started. My experience with everything has been GOOD. My machine liked the thread, I have used up my supply of pre cut tear away and will order more. It will take me YEARS to use up all the thread and bobbin thread I have purchased. ALWAYS use a WSS on top. ALWAYS. The theory has been to only use the WSS on things like towels and velvet or plush items that your stitches would sink into, but I saw a visible difference in “sinking designs” on t-shirts and cotton items. When your machine “acts up” stop, change the needle, clean the bobbin case, rethread everything and make sure you don’t miss anything. These machines are stitching FAST; 800-2000 stitches per minute, and a dense design, if improperly digitized may “bend” your needle. Thread single needle machines with the pressure foot up until you get to the needle, then lower it. It opens up all the tension areas, and you won’t “miss” getting your thread through the disk or channel. Don’t forget to check your BRAND of machines website. Brother is “my brand” and they offer lots of free designs and information. Join an embroidery “GROUP” on Facebook for your brand. I hope you find this to be a helpful lists of sources and fun places to window shop designs etc. If you know of other places that I may not have mentioned, PLEASE comment and include a link and why. I will periodically update this list.